Second Link, the production I was in last year, took home the Best Emsemble trophy which prevented another show from making a clean sweep of all the awards in the Theatre category. Too bad for them cos we deserved it. Modesty is not in my vocabulary. 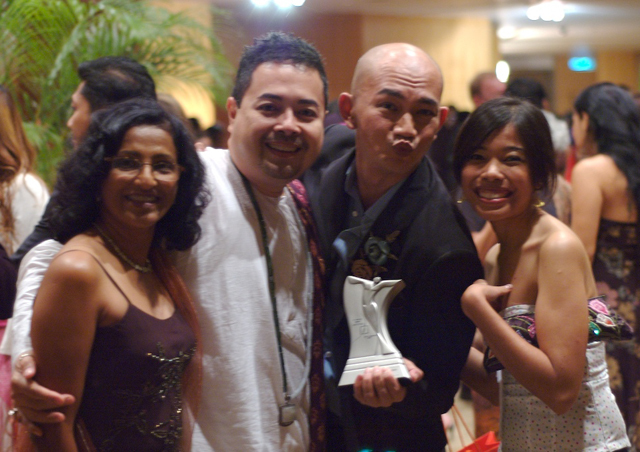 From left to right, Anne James, Reza Zainal Abidin, me (3 of the 10 actors) and Myra, one of the show's producers. My love to Krishen, Eleanor, Ivan, Puay Tin, Karen, Suki, Sweenie, Yu-Beng, Jonathan, Gani, Fahmi, Vernon, Juraidah, Kenny, Adrian but most of all to Marion... Thank you. This marks the end of posting KLDP. I have a busy year and already posting daily up till today has been a feat. I have commitments to fulfill and I'm afraid I'd be letting you down as I've noticed the quality of my pictures are below my own expectations. Kuala Lumpur is far too beautiful and deserves the best pictures. I will, however, still be part of the DP community. I'll post every theme day and when I find something good. I'll leave it to the reigning powers to decide whether KLDP is taken off the list or stays in it. It's been the best 15 months. I've met good people. Photography is now my best friend. And I've rediscovered Kuala Lumpur. Thank you for visiting. Dijah and Emily, our city is yours now. Thanks for taking this shot Chris. This is Nigel, a member of the acapella group The Wicked Pitches, nominated for several awards in the Music category. Unfortunately, the group didn't walk away with any awards. Nigel and his partner Allan, own and run a great little cake business called Just Heavenly. Anyone who's ever taken a bite of their cakes will tell you it's just heavenly. The friends, the rivals, the flurry of excitement and anticipation of who will win the awards this year. The coming together of Malaysian Performing Arts community at last night's BOH Cameronian Arts Awards and boy, did we love it! Most of the results weren't surprising especially in Music and Theatre. Dance was the one with the unexpected winners but they deserved it. 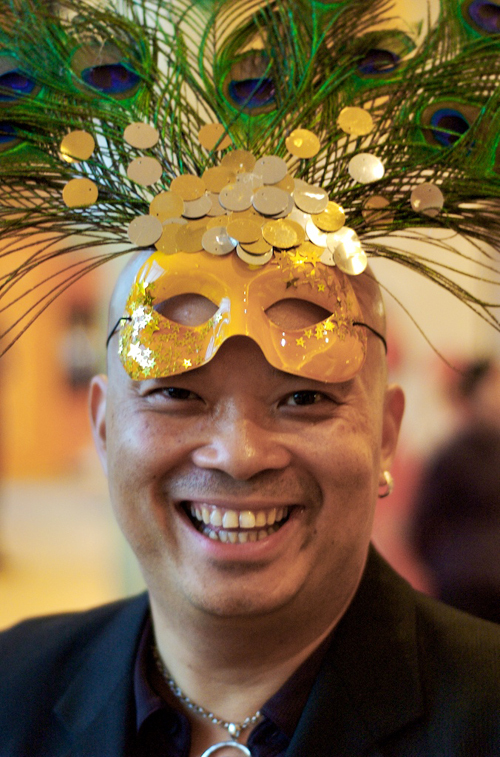 This year's theme for the night was Carnivale. This shot I captured in the midst of my catching up with friends and I feel it shows off the pre-show excitement. another awards night shot tomorrow. Lecka Lecka is an Italian style gelato shop. There aren't many ice-cream parlours in KL. 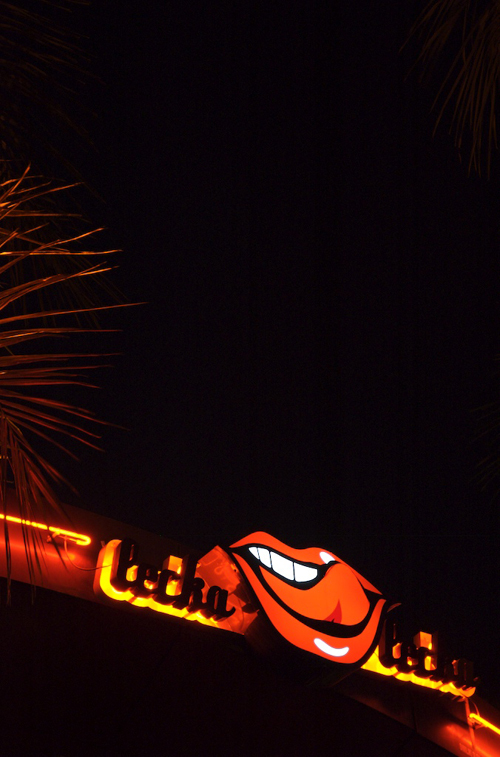 Joining Lecka Lecka are Baskin Robbins and Häagen Dazs. It's all up to flavours and texture. I like Baskin Robbins for the flavours and Häagen Dazs for the creamy texture. Lecka Lecka appeals to my designer's sense of style. I'm licking my lips just thinking about it. Tonight is the BOH Cameronian Arts Awards. 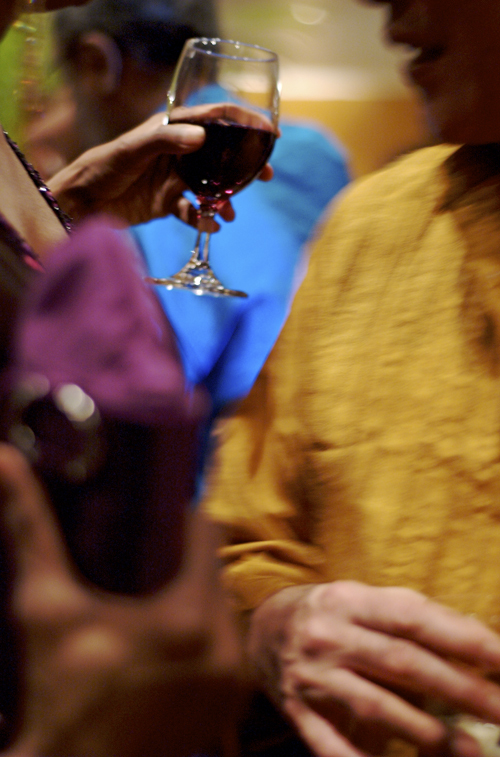 Musicians, dancers, actors, designers, directors will congregate and some of us will hopefully walk away with a gong. My company didn't mount any productions last year. However, I'm in for 'Best Emsemble' for Second Link, which some of you will remember from pictures I posted last year. Who knows? I haven't even figured out what I'm wearing. I should go out, get an ice-cream and lick my worries away. How fast do I drive? 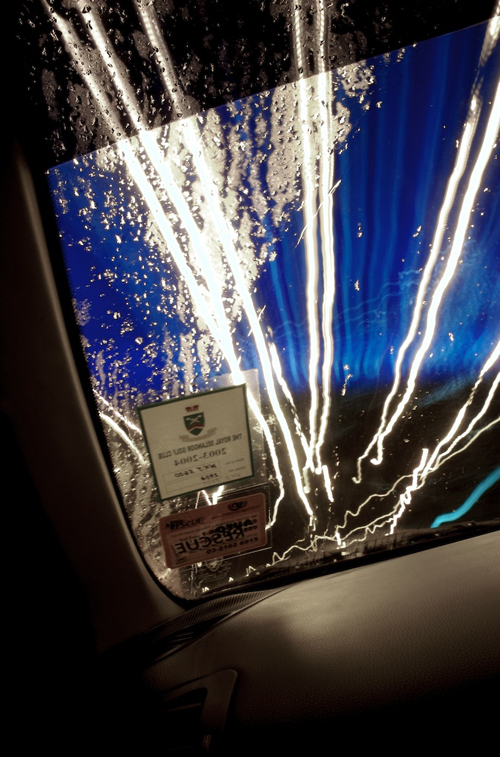 Judging by this shot, warp speed. Real speed? 50km/h. I was restless one night and remembered an article I read in my favourite photography magazine. So, I set up my tripod in the passenger seat, turned the ignition and sped away. There was a gentle rain which I think adds a texture to the streetlamp strips of light. It was late and I had the streets all to myself. KL at night, when it's quiet, is lovely. It looks set to be a good weekend. Wherever you drive, have a good time. This is a shot I took of Quek, a Capoeira dancer. He had just finished a session with the kids and was leaning against the wall watching them begin their drumming session with Paul (see Repercussions dated April 23rd '07). Quek was resting but that didn't last long. The beat of the drum got to him and I caught this shot as he made his way into the drum circle. 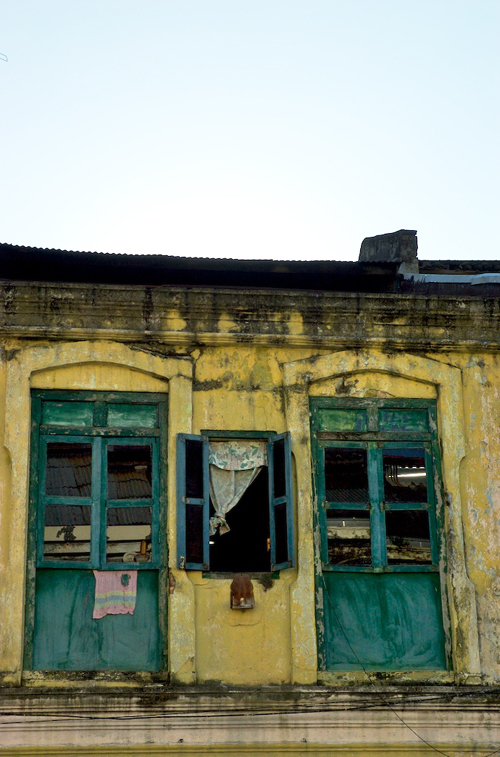 Here's another one of KL's many old buildings destined to be demolished. I hope not but who am I to decide? The block next to it is gone, replaced by an open parking lot. What more can I say? Fancy some fruit but can't be fussed to buy the whole melon? 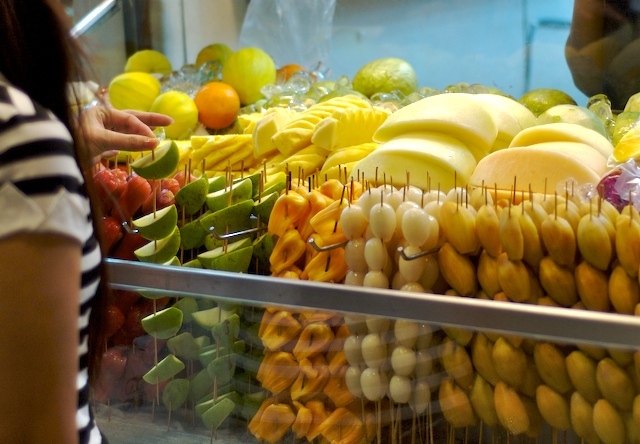 Well, you can get any fruit you want, freshly cut and skewered. Papaya, mango, jackfruit, rambutan, apple, watermelon, honey dew melon...slurp crunch crunch yum yum! It's that time again. This time rolling by with an interesting theme. How do you interpret 'City Exchange'? Is it posting a shot from another city, switching pictures with a fellow DP member or is it finding somewhere in your city that looks like somewhere else? Hmm, as clever as I am (pat on the back) I opted for somewhere not in my city. So, another city. One in my own country is best I think. 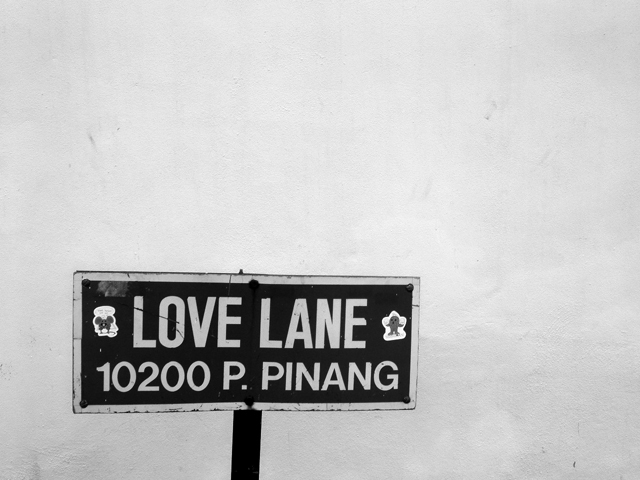 This is Love Lane in Penang, the island city up north of Peninsula Malaysia. I took this shot with my first ever digital camera waaaaaay back in 2003. My then-partner and me were there taking a short break from KL. After lunch we decided to go for a stroll around the older part of Penang and came across this road sign. This picture has been sitting in my hard drive ever since. Not seeing the light of day till now. For all of you. Lovely, isn't it? 80 DP cities are taking part in today's theme. Please feel free to take a stroll and see how each one has interpreted the theme.